GIMP Forums / GIMP / Plugins / PDN Plug-in for GIMP? 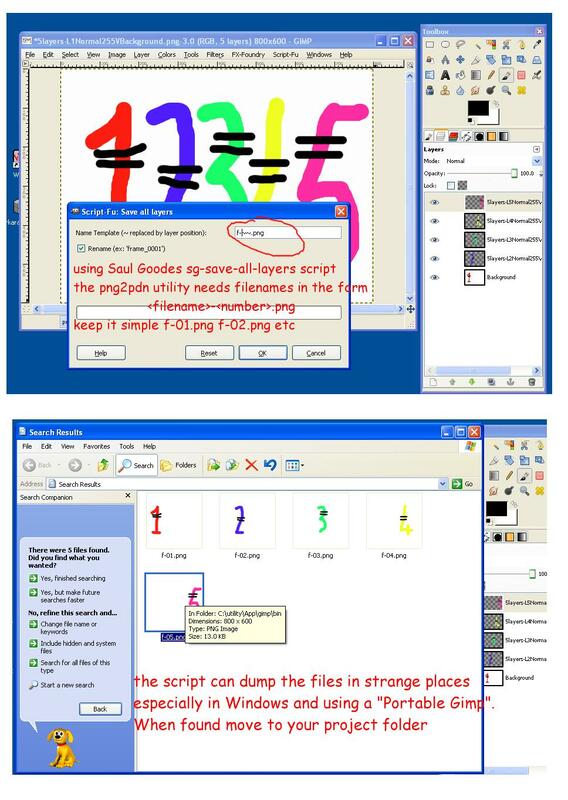 Has ANYONE worked up a plug-in to handle PDN files like the ones used in Paint.net? I really hate having to use two programs to do the job. Turning over 12 layers into 12 TGA files just to work with them in GIMP is tedious and time consuming. There has to be someone out there that feels the same way and can create the plug-in needed. RE: PDN Plug-in for GIMP? I just checked all of the file types that Paint.net saves in and it wants to flatten all of them! Bummer! I guess I go to the other end, Paint.net, and see if there is a plug-in for IT to output files other than PDN as layered, file types that GIMP can use. I know it sounds turncoat, but does anyone here know of any? Thanks, I'll look into these. I really hope they can save a bit of time. The only other option left is to save each layer in Paint.net and put them back together with GIMP. We'll see which is more tedious. (Sep 17, 2011 23:25)snoopy55 Wrote: Thanks, I'll look into these. I really hope they can save a bit of time. The only other option left is to save each layer in Paint.net and put them back together with GIMP. We'll see which is more tedious. Just as an exercise, how you might do it with the utilities. This is in a tatty old Tosh M1 laptop, the only thing I have with M$ .Net on, needed to run Paint.Net. Normally I use linux. First screen shot. I made a 5 layer pdn file. Made a project folder, copied the utilities and the pdn file to it. Opened a command window, navigated to the project folder, ran pdn2png to create separate png's for import into gimp. Second screen shot. Imported as layers into Gimp. A bit of editing, then exported the layers to individual png's using sg-save-all-layers script. I like this script but use whatever you are comfortable with. Move the files to the project folder. Third screen shot. Back to a command window. 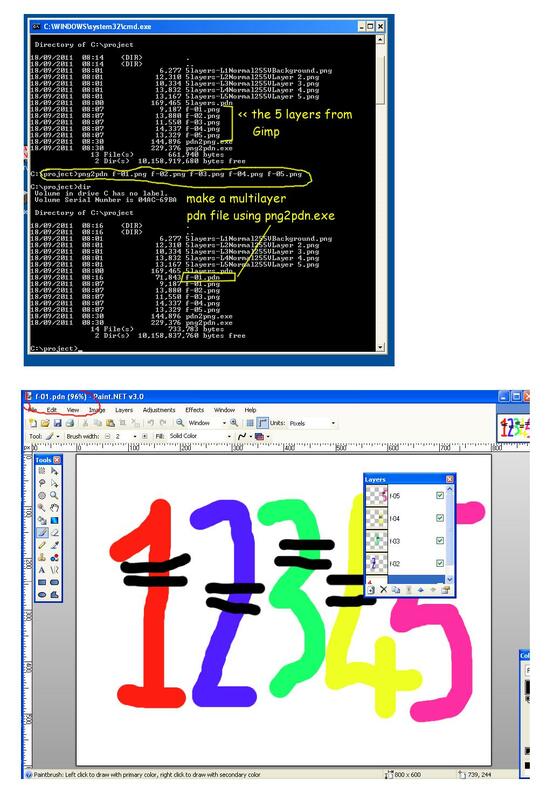 Run png2pdn.exe to combine the png files to a multilayer pnd. Open in Paint.Net for comparison. If you have lots of layers (guessing you do) the command line is tedious, I copied the first file name 'f-01.png', pasted back in several times then went back and changed just the layer number. Should not be too difficult to make a batch file to automate the process. I was just wandering around looking at Paint.net's site and I think I may have found another way around this problem. On Paint.net's forums they have an area dedicated to plugins. There is a plugin there that gives Paint.net the ability to save (and open) files in PhotoShop's .psd format. Gimp already has the ability to handle .psd files, and of course .psd files are natively capable of handling multiple layers just like the .xcf and .pdn formats. If everything works the way it sounds like it should, you could save your Paint.net file as a .psd, then open it in Gimp with all the layers intact. You could also go back from Gimp to Paint.net the same way. 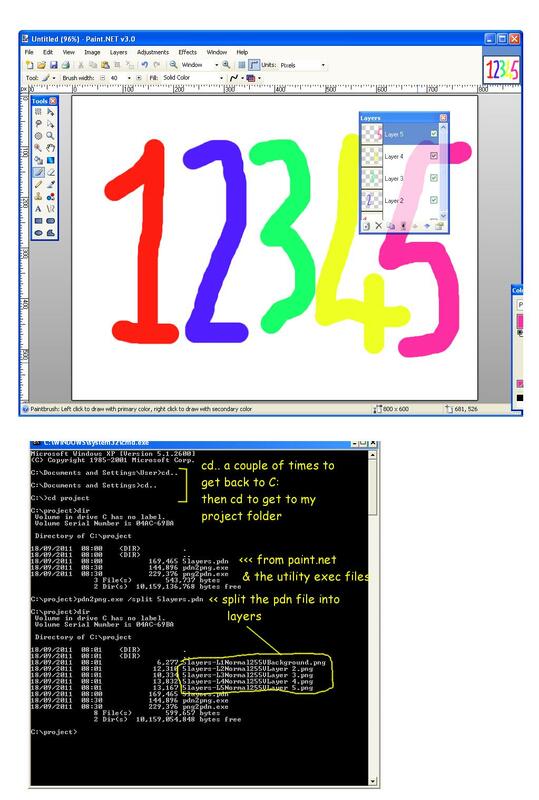 I don't actually have Paint.net installed on my machine so I haven't tried this, but it seems like it should work. There is an XCF plugin available for Paint.NET in the meantime. Using this you are loosing less information then by using PSD as exchange format. A PDN plugin may be possible. The biggest issue is that a PDN file contains some .NET data structures. So you would need Mono to interpret the file. But this issue has been solved by a .NET decoder/encoder library written in C. This library is used in the PDN plugin available for Irfanview (by the way Irfanview also supports XCF). I know I'm answering in an old thread but nevertheless I am currently changing from paint.net to Gimp myself (not getting my tablet to work correctly in paint). What I'm doing to make it possible to open the files with layers is to save them in the .psd format in Paint.net using the following plugin. Then just opejn it in Gimp like any normal psd file. Hope this helps anyone else that might be having the problem. You can use below pluginin in paint.net to save file to xcf file.